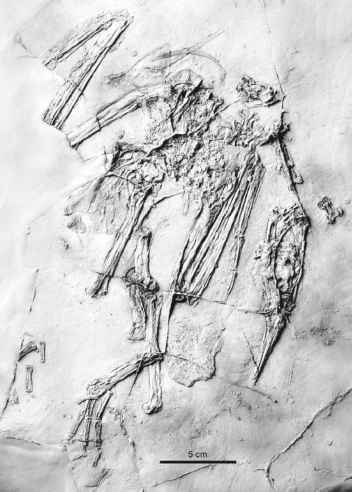 One of the best represented Paleogene species of the Gruoidea belongs to the early Oligocene Parvigruidae and is known from a complete skeleton from the Luberon in France. This species, Parvigrus pohli Mayr, 2005, is a chicken-sized bird with rather short legs. Its assignment to the Gruoidea is supported by the elongated and narrow sternum which lacks deep incisions in its caudal margin, and the presence of a medially protruding projection on the proximal end of the first phalanx of the fourth toe (Mayr 2005c). As in the Rallidae, Gruidae, and Aramidae, the caudal end of the mandible bears a hook-like retroarticular process. The beak is of proportions similar to those of the Psophiidae, but with longer narial openings. The length proportions of the limb bones are "rail-like," i.e., the ulna is shorter than the humerus, the femur is as long as the humerus. The toes are proportionally longer than those of the Gruidae but are less elongated than in the Aramidae. In the original description (Mayr 2005c), P. pohli was considered to be the sister taxon of the Grues, i.e., the clade (Aramidae + Gruidae), because it agrees with the latter and differs from the Psophiidae in the greatly elongated narial openings, the plantarly deflected trochlea for the second toe, and the presence of ossified tendons along the hindlimbs. I did then, however, not recognize that Rupelrallus saxoniensis Fischer, 1997 from the early Oligocene of Germany is probably another representative of the Parvigruidae. This species is based on several bones of a single individual, including a fragmentary furcula and coracoid, a complete carpometacarpus, and distal ends of the tibiotarsus and tarsometatarsus. R. saxoniensis was assigned to the Rallidae in the original description (Fischer 1997), but differs from rails in the much wider sternal extremity of the furcula and the longer lateral process of the coracoid. The species is also larger than any extant species of rails and closely resembles the contemporaneous, slightly smaller Parvigrus pohli in the preserved skeletal elements (Mayr 2006c). The distal tibiotarsus of R. saxoniensis lacks a tubercle at the supratendinal bridge and is similar to the distal tibiotarsus of extant Rallidae. The sternal extremity of the coracoid bears a marked depression, but judging from the published figures and description it lacks pneumatic foramina. The latter two features, which for reasons of preservation cannot be discerned in the holotype of P. pohli, distinguish the Parvigruidae from extant Gruoidea and indicate that these birds are the sister taxon of the Gruoidea, rather than the Grues as assumed previously (Mayr 2005c). This revised phylogenetic position is also in better agreement with the fact that the caudal margin of the sternum of P. pohli exhibits a pair of shallow incisions, whereas it is entire in extant Gruoidea.